ChimneyRx Paint N Peel Fireplace Cleaner is easy to us and highly effective cleaner designed to remove smoke stains, soot and grime form fireplaces. Over time small black carbon-based particles embed into your masonry surface around your fireplace. 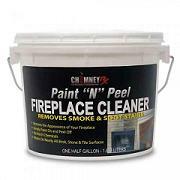 These stains are very difficult to remove and usually require the use of harsh chemicals in your home with a lot of time and mess until now... With ChimneyRx Paint "N" Peel Fireplace Cleaner your fireplace can look new again. The cleaner is specially formulated to remove smoke and soot stains. It's as easy as 1,2,3. Paint on,Let it Dry, Peel it off.